Special guests, celebrities and press will be invited to an exclusive upscale location for an afternoon retreat including gifts, refreshments and special surprise announcements from Noirtainment Productions. Malibu, California (Issuewire.com) - Noirtainment Productions, along with National Talent LA will host a Pre-Oscar Retreat event for guests the Friday before the Oscars in the late morning through the afternoon on February 22, 2019. Noirtainment Productions is currently in pre-production of their first scripted series for television, Marisa Romanov, to premiere on Amazon Prime. Guests of this event will include, but not limited to the Showrunner/Creator Miranda Spigener-Saponas well as other Executive Producers and some of the cast. Sponsors of the event and special gifts include Bonafide Mom’s Spot, Neutrogena, Kiehl’s and Sunlife Organics, Leaff Belgium Chocolate and more. Confirmed guests will receive the location privately. National Talent LA (NTLA) is a new, exciting and innovative talent agency based in Los Angeles, CA. Founded in 2017 by international model, Karen Patmas, NTLA is a dynamic company with a fresh approach. Committed to core values of ethics, integrity, transparency, service, and transformation, NTLA insists upon upholding the highest professional standards while serving the needs of both talent and clients. With 20 years’ experience as a behavioral health therapist, Karen Patmas has a lot of experience managing high-stress situations. As a therapist, Karen ran her own practice, was instrumental in developing a Behavioral Health department within a hospital system that was comprised of a multidisciplinary team, and helped with several shootings. NTLA helps talent forge successful careers enhancing their brand and that of our clients to transform the industry. Noirtainment is a SAG-AFTRA/WGA/DGA Signatory film and television production company based in Los Angeles that produces dark, independent and thought-provoking and breathes the motto “finding light in the darkness.” Recently, Noirtainment participated in their first MIPCOM in October 2018 at Cannes, France where they developed relationships with several studios, foreign broadcasters, and international studios and production companies. The company is releasing a documentary feature film series Masculinity That Inspires Change directed by Miranda Spigener-Sapon and written by Gunter Swoboda, based on his Good Men Great global movement. The film will debut on Amazon Prime. They also have a full development slate of projects with deals in place: Intrigue, The Phone, and Letters to Lauren as well as a mini-series Just Us that has a first look deal attached. Miranda is also writing the prequel novel Charles: A Marisa Romanov Story that is the first of 4 novels to the series and will be published November 2019 by Winterwolf Press. The film rights are currently under option for a feature film. 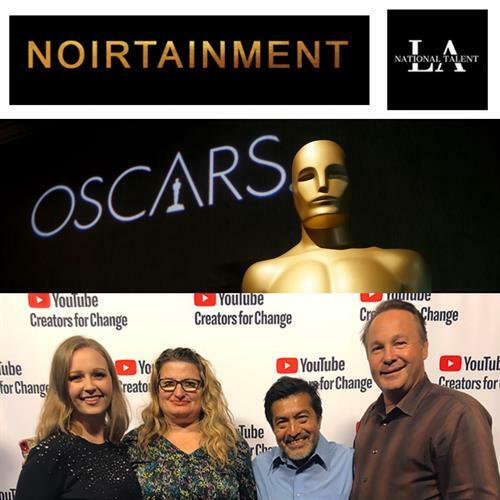 Noirtainment Executive Producer Team is Miranda Spigener-Sapon, Pete Freeland (VP of Production), Nick De La Rosa and Soraya Tascon. Lauren Packer has recently joined the team as Writers/Development Assistant. Miranda Spigener-Sapon also serves as President of Production, is repped by agents Karen Patmas and Paula Allen/National Talent LA, manager Will McPherson/M3 Literary Management, Publicist Jamie Goucher at MS Film PR Literary and David Kim, Esq./The Hollywood Lawyer. Noirtainment is a proud member of the Malibu Chamber of Commerce. If you would like to RSVP to be considered to attend or if you are press and would like to cover the event, please contact Lauren Packer at 855-909-6647 ext. 805 or lauren@msfilmprliterary.com. Location disclosed upon RSVP approval/confirmation. Free with approved RSVP confirmation.